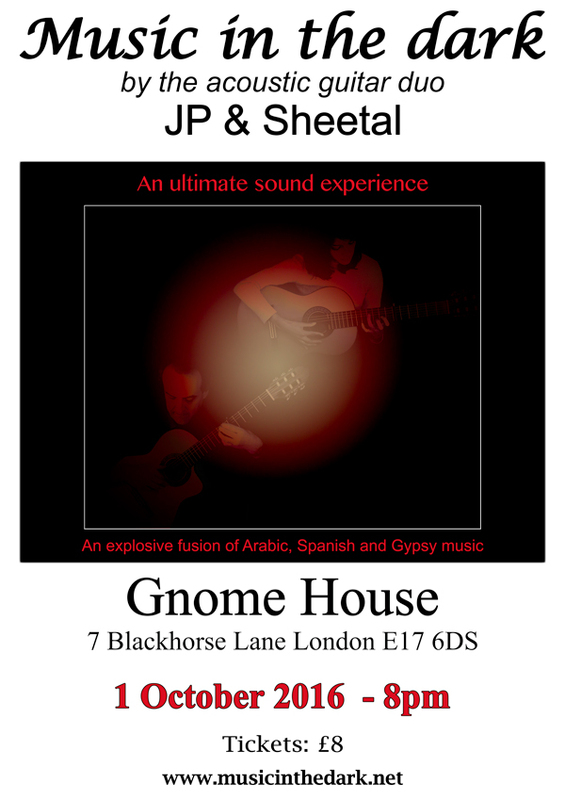 Acoustic guitar duo JP & Sheetal bring you their unique and haunting sounds: a fusion of Arabic, Spanish and Gypsy music. The sequences in the dark will wow your senses. An ultimate sound experience! Much more than a performance, Music in the dark is about feeling sound in its purity. Evocative and intimate but also fiery and passionate, JP & Sheetal's music sets you off on a refreshing journey. "Beautiful, haunting and powerful music"
"A wonderful infusion that sent me on a journey"
Three tunes will be played in complete darkness to experience the power of sound. All songs are original. Music in the Dark was sold out in 2014 at Brighton Fringe Festival and in London at Etcetera Theatre during their first tour. 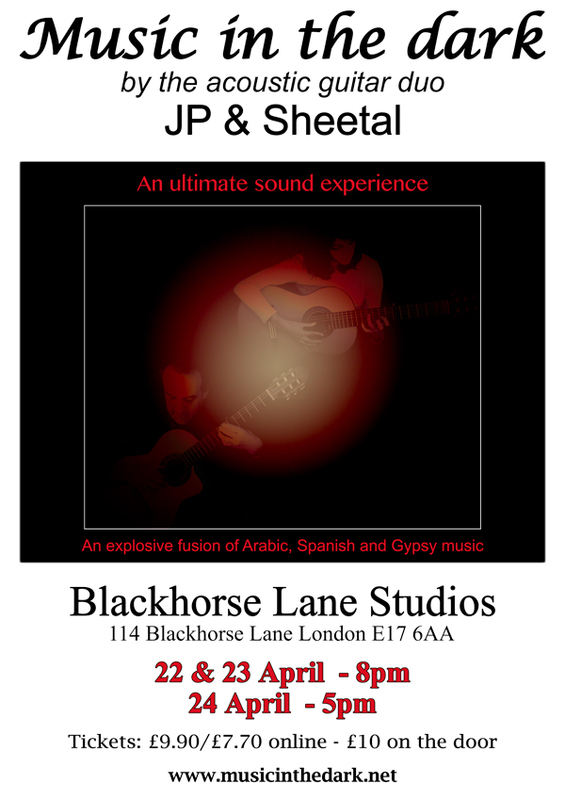 Music in the Dark was sold out in 2015 in London at Blackhorse Lane Studios for 2 days in a row. Three tunes will be played in complete darkness to experience the power of sound. A selection of JP's visual work will be exhibited, refreshments and snacks will be provided. Due to limited availability it is recommended to book in advance - only 30 places are available for each show. It is possible to buy tickets on the door but it is recommended to check availability beforehand. 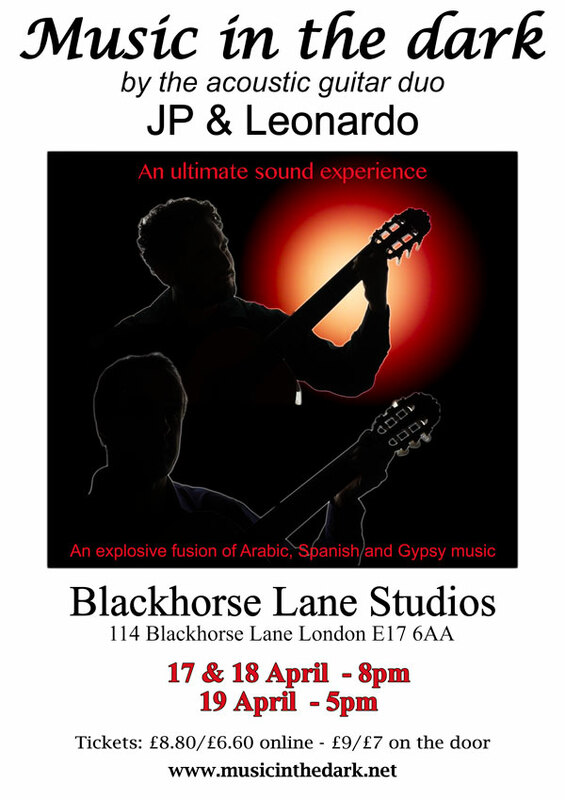 French-Mexican acoustic guitar duo JP & Leonardo bring you their unique and haunting sounds: a fusion of Arabic, Spanish and Gypsy music. The sequences in the dark will wow your senses. An ultimate sound experience! Much more than a performance, Music in the dark is about feeling sound in its purity. 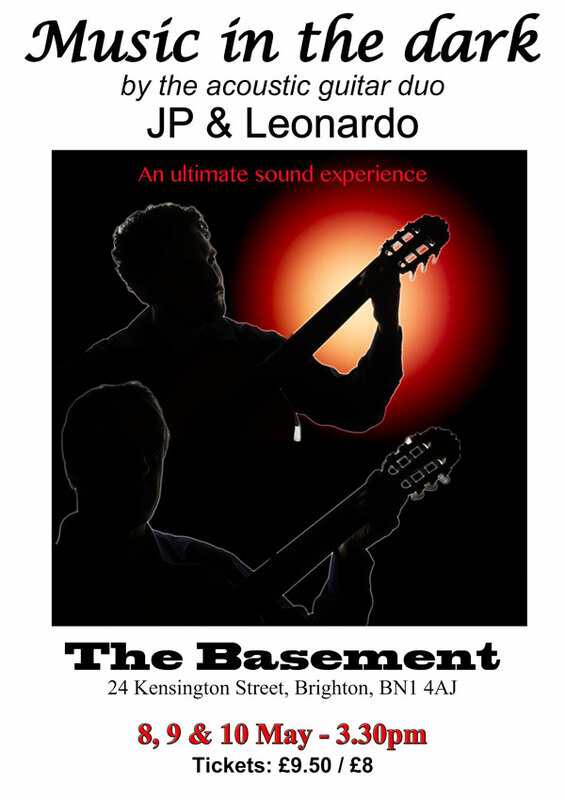 Evocative and intimate but also fiery and passionate, JP & Leonardo's music sets you off on a refreshing journey. 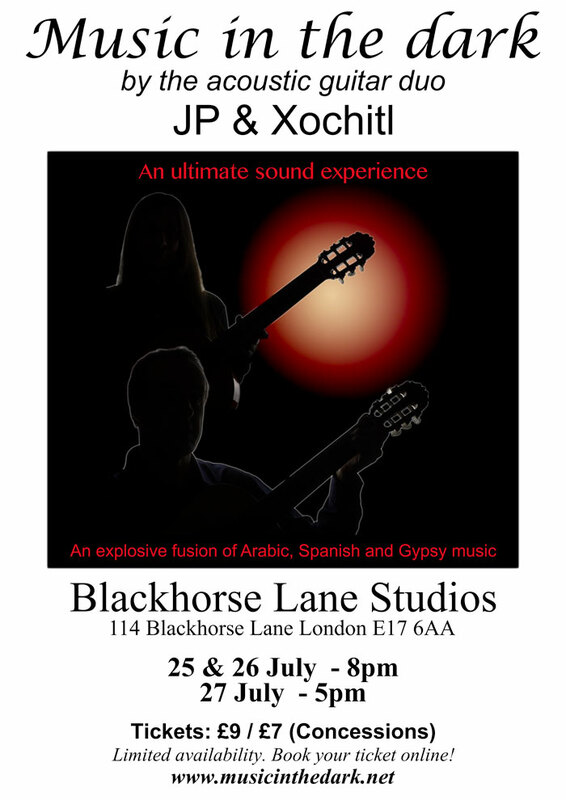 French-Nicaraguan acoustic guitar duo JP & Xochitl bring you their unique and haunting sounds: a fusion of Arabic, Spanish and Gypsy music. The sequences in the dark will wow your senses. An experience you will want to relive! Much more than a performance, Music in the dark is about feeling sound in its purity. Evocative and intimate but also fiery and passionate, JP & Xochitl's music eludes definition and sets you off on a refreshing journey: a journey of self-discovery. A selection of JP's visual work will be exhibited - Refreshments and snacks will be provided. Due to limited availability it is recommended to book in advance - only 25 places are available for each show. Two tunes will be played in complete darkness to experience the power of sound.